Passport Designs Soundchaser "Bring your computer to your senses..." 1/4 page black and white advertisement from the bottom left side of page 13 in the August 1981 issue of Keyboard Magazine. This ad may be small, but its deadly. It represents a key turning point in technology that spelled out the slow beginning of the end of the Fairlight era.This is one of the earliest, if not *the* earliest, Soundchaser ad to appear in Keyboard magazine. Every new company has to start somewhere and this one started with a 1/4 page black and white ad with some of the smallest text around. I had to take out my reading glasses to get a good look. If you follow me on Twitter, you may know that I'm a bit infatuated with older computers and software sequencers. Atari 520/1040 ST and Commodore 64 in particular, and Amiga hardware and software have also been floating my boat a little bit. When curiosity took over and I decided to take a look back in the magazines and get a better idea of what was happening at the beginning of the home computer-studio revolution, I suddenly found myself deep in pre-MIDI-land. What became interesting to me was the time period when systems that used relatively cheaper home computers started to steal turf from larger systems that used proprietary hardware. Sure, keyboards that piggybacked on home computers still cost a lot back in 1981 - you did need to buy the home computer as well - but, they were still way under those larger systems that relied on what I presume was custom hardware. According to Roger Powell's July 1982 Keyboard article "Practical Synthesis - A Quick Tour of Digital Synthesizers, prices for larger custom systems were in the $15,000-50,000 price range. That includes systems like the Fairlight ($27,750), Prism ($49,000), Con Brio ADS 200 ($28,500) and Synclavier II ($13,750). Now, compare that to home computer -ased systems and you begin to see my point. This included set ups such as the Casheab Music System based around an S-100 computer ($6,000). That thing came with dual 5" drives, 5-octave keyboard and sequencing software. Already got the computer? No problem - you could get the two-board hardware for $1,095. Side note: Yeah, I'd never heard of the S-100 computer either. According to the s100computers.com Web site "these computers were the first home computers people used before IBM-PC, Apple etc. computers existed." And about 20 manufacturers made these things by the thousands, including kits. Interesting stuff. Probably more familiar that the Casheab system is the Alpha Syntauri that was based around an Apple II home computer. The computer, with disk drives and CRT monitor cost $3,020. And then the keyboard, including interface card and eight-track software would run between $750 - $1495. The system used Mountain Computer's Apple II sound card (I think they ran about $350-400) to give the system a whopping 16-note polyphony. And then of course, there was the Soundchaser system by Passport Designs - the subject of this ad. If you've been around long enough you might be familiar with Passport Designs. My first Apple IIe MIDI sequencer was Passport Design's Master Tracks Pro. But one of their earliest products promoted in Keyboard Magazine was Soundchaser. 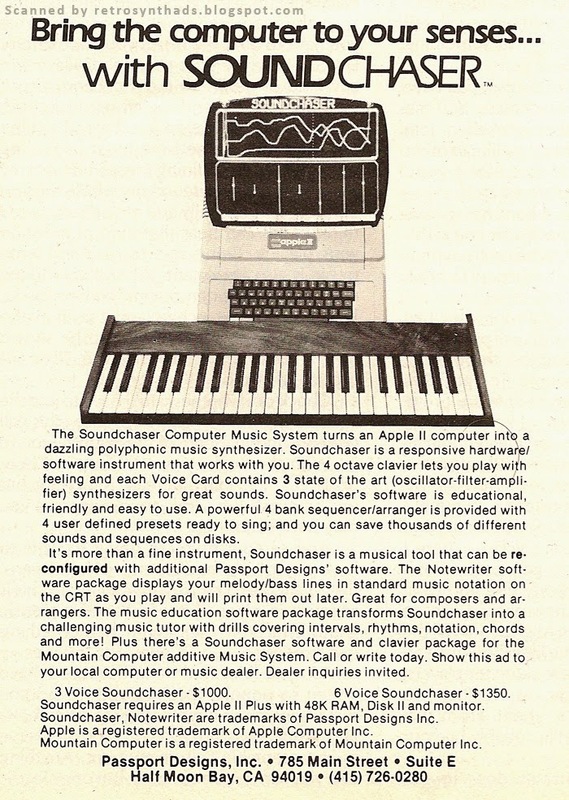 Like the Alpha Syntauri system, the Soundchaser system used an Apple II computer and according to this ad,included a 4 track sequencer. There was also Note-writing and education software packages available. The ad also gives us pricing - a single 3-voice card went for $1000, and their 6-voice (two cards?) for $1350. The ad also states they created a Soundchaser package for the mountain computer sound card that I already mentioned above. Nice! More on these systems in future posts!